An inmate smashed a prison officer across the head with a weighted sock when he went to check on him. A court heard there had been concerns over Lee Gamble’s propensity to self-harm and so principal officer Roy Smith went to check on him in his cell in Walton jail. He could not look through the observation panel as 51-year-old Gamble had smeared faeces over it and so Mr Smith opened the door slightly, said Simon Duncan, prosecuting. “Gamble pushed it open and stood there waving a weighted sock, ready to attack. The sock contained shards of porcelain and he almost immediately ran out of his cell and with his left hand grabbed hold of him and with the other hand swung at the back of his head. He tried to swing the sock again but Mr Smith was able to stop him and they both fell to the floor and with the help of two colleagues restrained him,” said Mr Duncan. Mr Smith later went to hospital where he was found to be bleeding profusely from a 2cm abrasion. Following the incident on April 11 last year Gamble, who was serving four years for arson being reckless whether life was endangered, refused to be interviewed by police. Mr Duncan said that in an impact statement Mr Smith described it as “the worst attack” he had experienced and he had to take time off work and suffered from headaches. 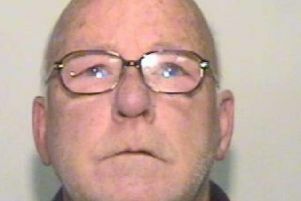 Gamble, formerly of Harrow Road, Marsh Green in Wigan, was due to appear at Liverpool Crown Court for sentence via video link from Forest Bank prison, where he is in the medical unit, but he refused to take part. Gamble who had pleaded guilty to wounding, was sentenced to 14 months’ imprisonment. The court heard that he had been due for release last month from his previous sentence but was kept in on remand and is on licence for another two years. David Potter, defending, said that while in prison Gamble has been secreting away tablets prescribed for migraines and last month took an overdose. He is concerned about various matters and is considered at on-going risk of self-harm. “At the time of the incident he had been acutely paranoid thinking that he was under attack from other prisoners,” said Mr Potter. He said that Gamble’s mental health problems did not warrant consideration under the Mental Health Act but he said that “stringent conditions should be attached to his licence on release to protect the public and alleviate any mental health issues”. In 2015 Gamble admitted arson being reckless to whether life was endangered after a series of incidents surrounding his attempts to commit suicide in which a pensioner died. He set fire to his shed just yards from lethal gas canisters in his garden, then after driving off then tried three times to kill himself with exhaust fumes in his car. After being taken to hospital by concerned police he fled and accidentally knocked over an elderly patient Joyce Carney who suffered a broken hip and later died. Gamble denied manslaughter, dangerous driving and two offences of attempting to cause grievous bodily harm and after a trial was cleared.